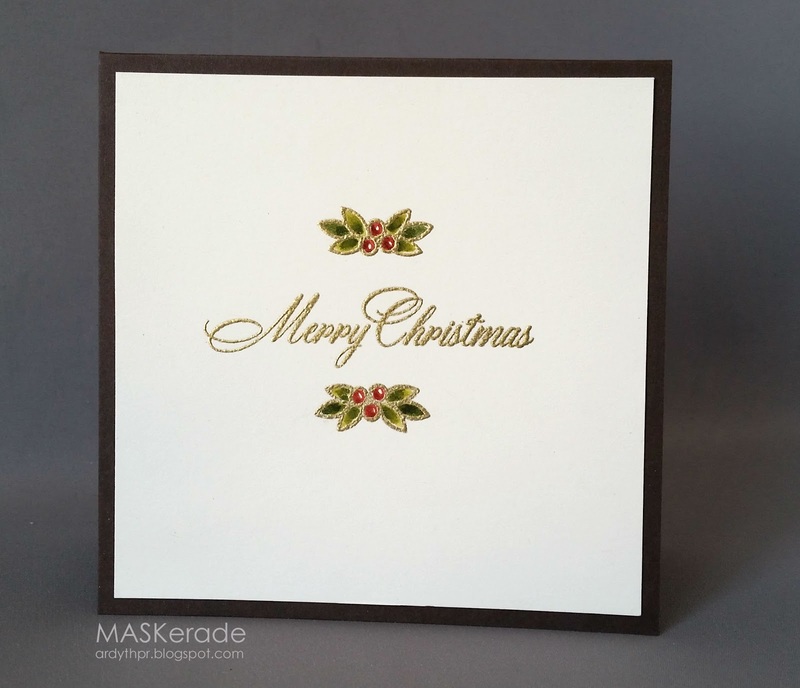 MASKerade: MM154 - Merry Christmas! This week's Merry Monday challenge is "Let's Get Vintage". Um. No. I don't do vintage. Or so I thought! Then I remembered another challenge a long time ago, where the theme was Rustic. I didn't 'do' rustic back then (I still don't very often!) but I ended up with one of my all time favourite Christmas cards. So in the same way I challenged myself two years ago to combine Rustic and CAS, yesterday, I challenged myself to combine Vintage and CAS. I think it was a success! I started by using vintage-y colours (cream and Early Espresso), but keep the layout very simple. I used a script sentiment (unknown) and a 'vintage' PTI set, embossed in gold and then I coloured the leaves with distress markers in dark, muted colours. This is so simple and elegant! Love the gold embossing! Clever - you have definitely succeeded with CAS & vintage! A definite success. This is amazing Ardyth. I think it was a success too, very pretty!! I don't "do" vintage either, but sometimes we surprise ourselves! Your card is not only vintage, but CAS at it's finest! Thanks for sharing with us at Merry Monday! Another winner for sure! You designed with a most favourite "vintage" stamp that I own too and have used many times, but not as brilliantly as this! you do vintage very well, it's beautiful. This is so simple but beautiful. It will stand out on some lucky person's mantlepiece. What a beautiful card! So simple, and elegant. I love that gold embossing powder!! Wow Ardyth, this is just gorgeous. So classy and yet stylishly vintage too! You definitely did it!! This is beautiful!!! So pretty! I also love the size of your card! It really caught my eye on the Merry Monday blog! Beautiful and I love the CAS style, Thank you for joining us for Merry Monday this week.